In the meantime, the bayou has been busy flooding, filling in, replanting, and beautifying the badly designed outfall, floods being a necessary function for regenerating and reseeding the floodplain, providing food and habitat for wildlife. 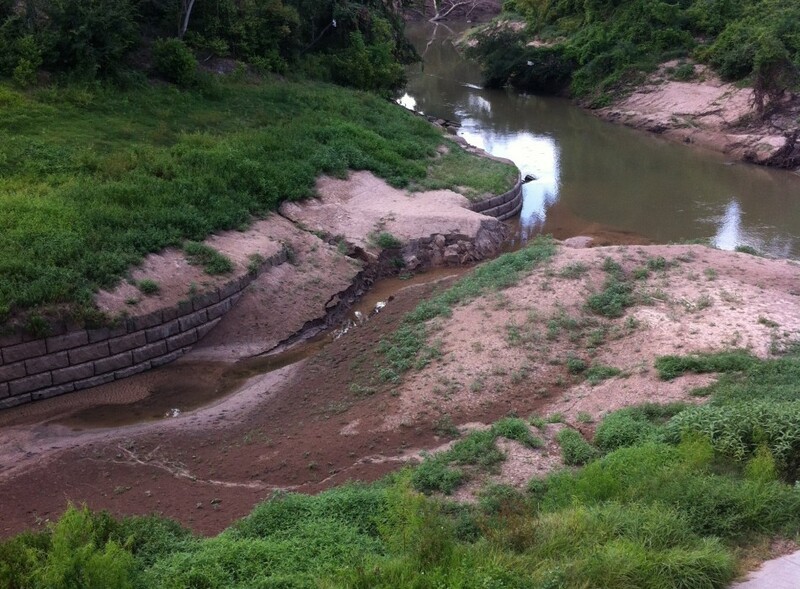 The massive outfall was carved out of what has been known for decades as the Old Archery Range west of Loop 610 at the Woodway Bridge. In the nineteenth century, the sandstone ford there was known as Dutchman’s Crossing. This forested area of Memorial Park was surprisingly included in the TIRZ 16 when the zone was created in 1999 (see page 18), and a few years later the publicly-owned woods were closed to the public and the pathways ripped up. Documents creating the TIRZ 16 describe the public parkland variously as commercial, industrial, and undeveloped property. (See pages 20 and 22.) Alas, it appears that the enchanting woodlands area of the archery range behind the outfall/boat launch will remain officially closed. We’ll have more on that later. Note that it is illegal to take or change the use of public parkland without a public notice and hearing. Fortunately, whoever has been scraping up the mud collecting there (Breeding didn’t know) seems largely to have given up. In fact the mud-scraping seems to have been mostly confined to the maintenance path itself. In other words, it was the maintenance road, too narrow for a regular vehicle, that seemed mainly to need maintaining. 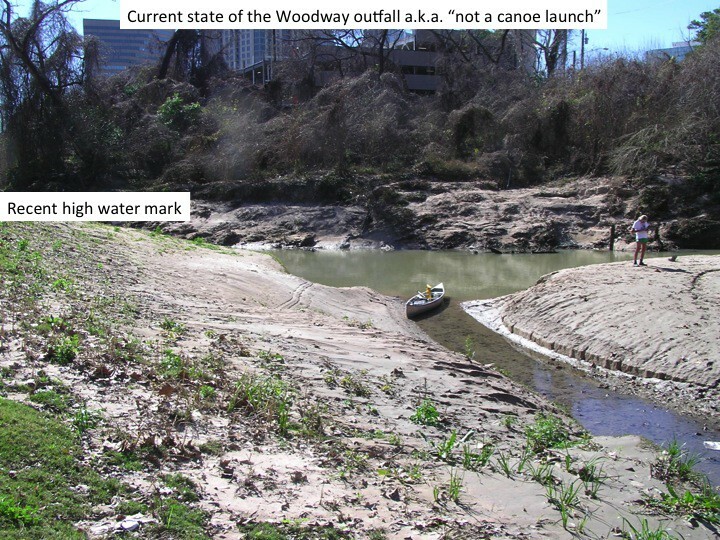 To his credit, Assistant Parks Director Rick Dewees once suggested a porous concrete grid maintenance path for the outfall, based on documents obtained by Save Buffalo Bayou through a Public Information request. Parks Director Joe Turner nixed this good idea in favor of an impermeable concrete path that needed to be cleared of mud – nixed because concrete is what flood control uses, according to the documents. This area of the park at Woodway is the beginning of the park that borders on Buffalo Bayou, and from here the bayou flows along the entire southern edge of the park, including the Arboretum and the Hogg Bird Sanctuary. This closed public access point (you can still enter from under the bridge) allowed the public to float through the lovely historic natural area slated for destruction by Harris County Flood Control District’s “erosion control” project, known as the Memorial Park Demonstration Project, a project instigated and promoted by the Bayou Preservation Association. 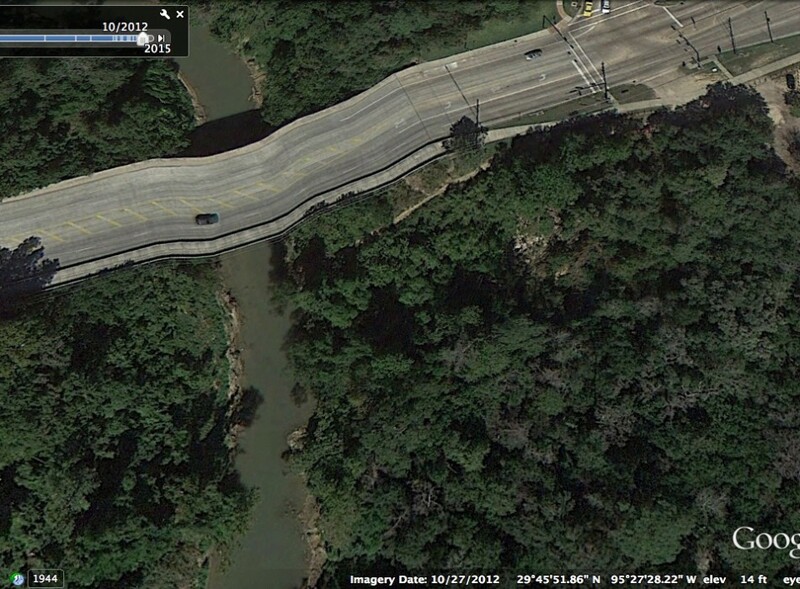 It is one of our last remaining natural stretches of Buffalo Bayou in Houston. It was the maintenance road, according to statements from Parks and TIRZ last November, that needed a guardrail to protect the public from the edge of the declining five-six-foot embankment while strolling down the gently-sloping bank to inspect the huge ugly drainage outfall and the bayou flowing past it. Or members of the public who more likely might eventually once again be carrying canoes and kayaks back and forth from the parking lot to the paddling trail takeout. Now, in a few months, the concrete path will have a low post-and-cable railing that is not so much a guardrail but may “keep dogs from jumping over,” said Breeding. There will also be a low split-rail fence inside the oak trees planted parallel to Woodway, which sounds nice and unobtrusive; a simple barrier gate to keep cars out at night, new loose gravel for the old loose gravel parking lot. And the park informational kiosk will be restored. We did notice a lot of dog-prints in the mud last weekend when we visited with native plant specialist Katy Emde. Also some raccoons. 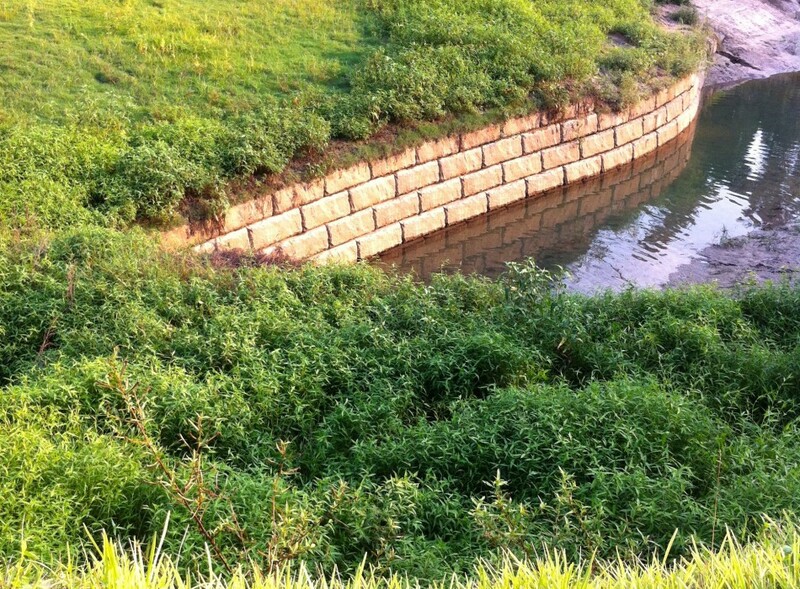 The “erosion control/outfall” was an ugly wound in the side of the steep banks of the bayou. The outfall project removed many trees and carved a huge gash in the banks, which were planted by the TIRZ contractors with St. Augustine and Bermuda grass, neither of them native. 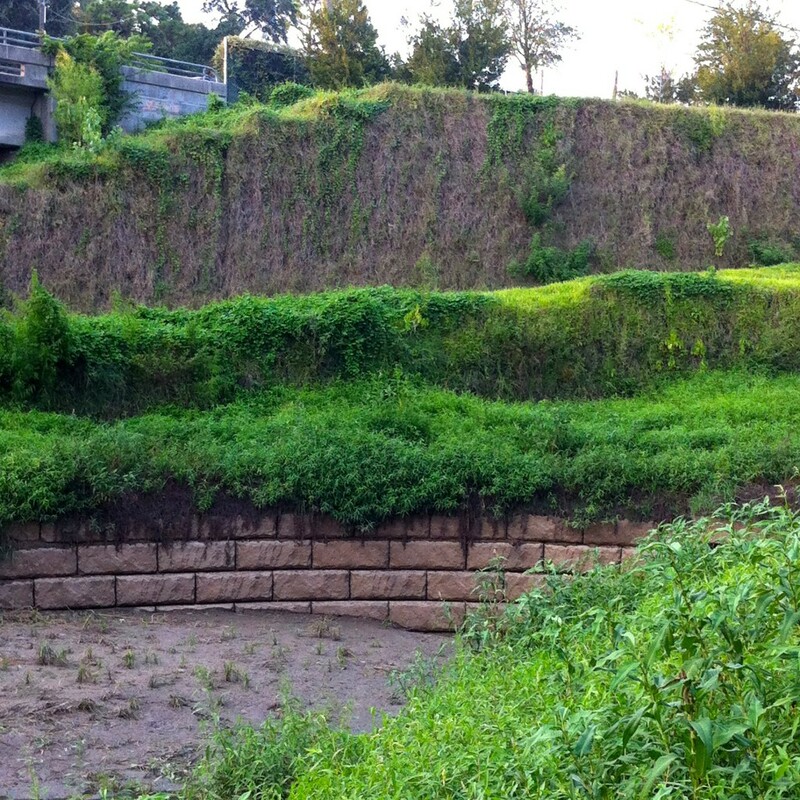 The high wall above the concrete maintenance path was also planted with draping Bermuda grass. It appears no trees were planted other than the oaks up near the roadway. Trees, it should be noted, are important for controlling erosion of the soil, and for slowing, deflecting, and filtering rainwater runoff, among many other functions. 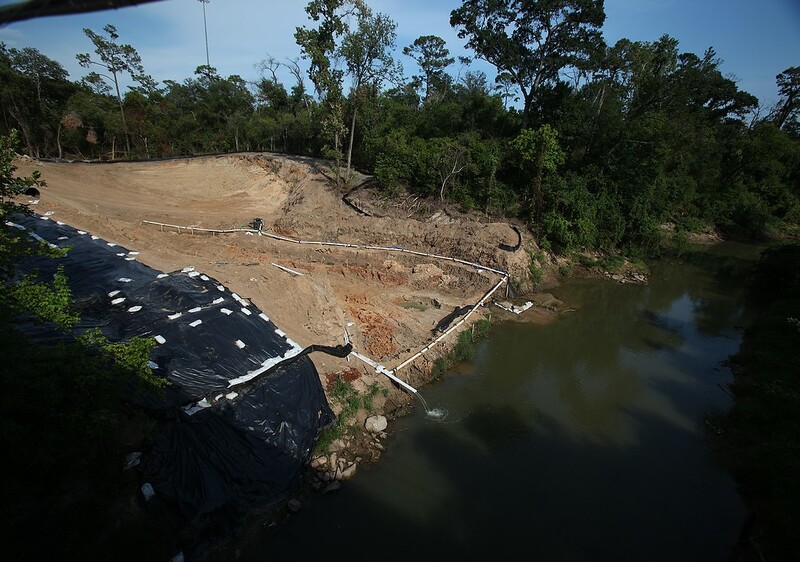 A forest, in fact, can have more stormwater detention capability than a detention pond. Native Plants Vital for Sustenance of Local Ecosystem. Humans Included. There were large, lush green fields of tall amaranth, two species of smartweed (also known as pepper plant), ground cherry, purslane, and snoutbean, all nutritious native edibles eaten since maybe the beginning of time. “Lots of smartweed, so that’s good,” said Emde. Purslane, also known as verdolaga, is so nutritious and abundant it’s sold in markets all over the world. We saw alligator weed, a noxious edible invasive that looks similar to smartweed. No local creatures eat it, and without predators it crowds out the valuable native plants, so eat it up. There was giant ragweed, an important bird food that like the other native plants, is also important for holding and building the soil, preparing the way for larger plant growth and eventual forest. There was late-flowering boneset (“Bees, moths, butterflies, wasps: everybody loves it”), tiny sensitive neptunias (touch-me-nots), asters, goldenrod, frogfruit, water willow, water primrose, Amberique bean (all good) and Vasey grass (bad) and nutsedge (also bad). Also volunteering were baby black willows (“Willows are host plants for over 450 species of moths all over the United States,” said Emde), box elders, and possibly some ash seedlings. We hope the new contract work will respect this nourishing natural landscape created by the bayou in support of the riparian ecosystem. 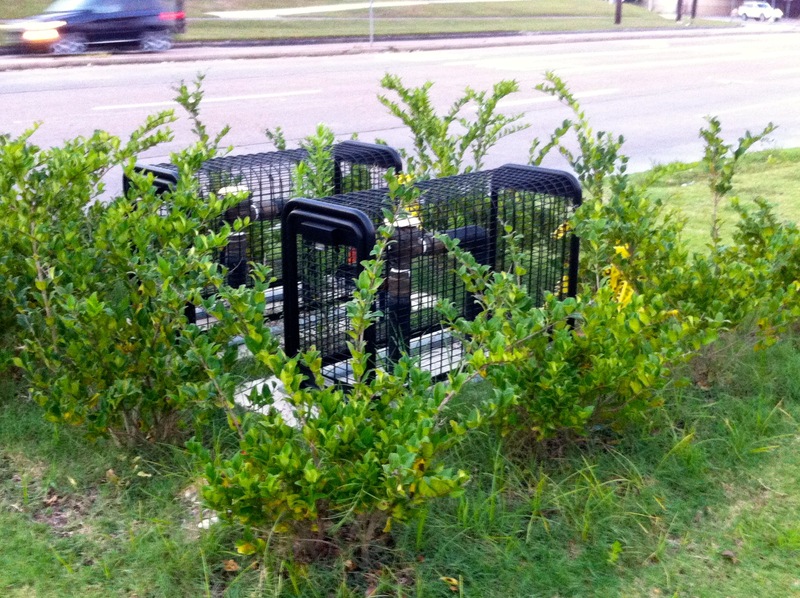 As an interesting side note, we’d like to point out that while the Memorial Park Conservancy has been struggling to remove the widespread invasive ligustrum behind the fence in the archery range, the City is planting ligustrum around a utility box outside the fence. Support Wildscapes and Native Plants! The Houston Chapter of the Native Plant Society of Texas is hosting a Wildscapes Workshop and Native Plant Sale on Saturday, Sept. 19, 2015, from 8:30 a.m. to 3:30 p.m. at the Houston Zoo Brown Education Center, 6200 Hermann Park Drive. Click here for information on how to register. 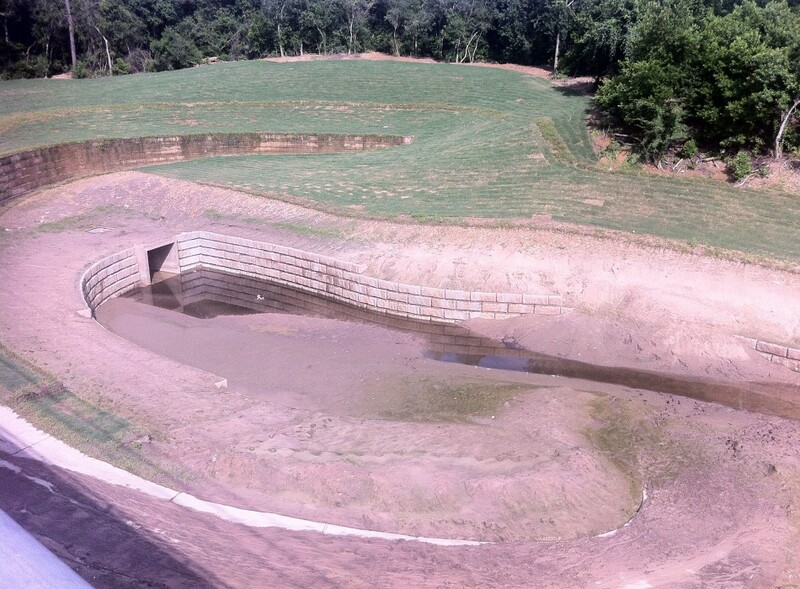 Watch this slide show of the evolution of the Memorial Park Woodway erosion control/drainage outfall completed in April 2014. 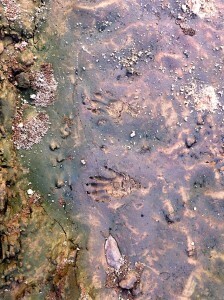 The Texas Parks and Wildlife Paddling Trail boat launch in Memorial Park at Woodway on Oct. 27, 2012. 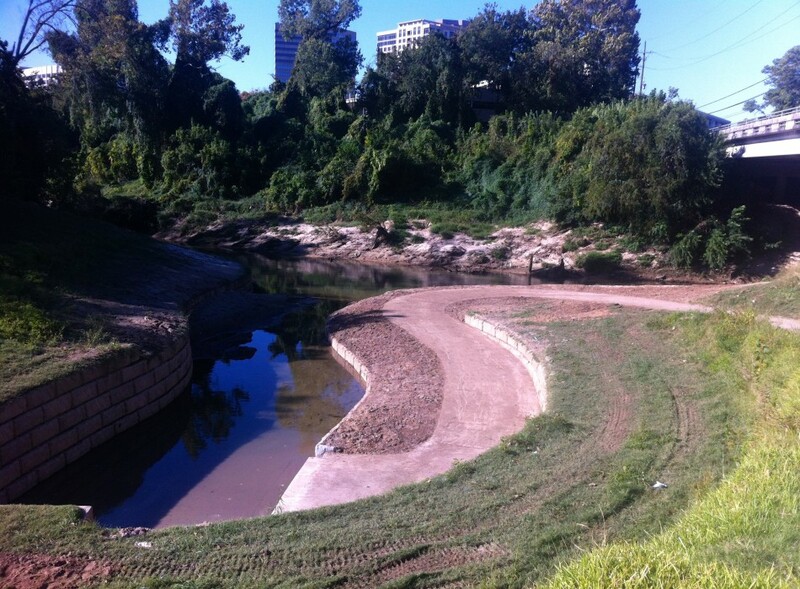 The formerly forested site of the boat launch on Buffalo Bayou in Memorial Park at Woodway stripped for construction of "erosion control/drainage outfall" project. Photo by Jim Olive for Don Greene, August 4, 2013. Completed but still closed former boat launch and denuded wooded nature area in Memorial Park, July 13, 2014. 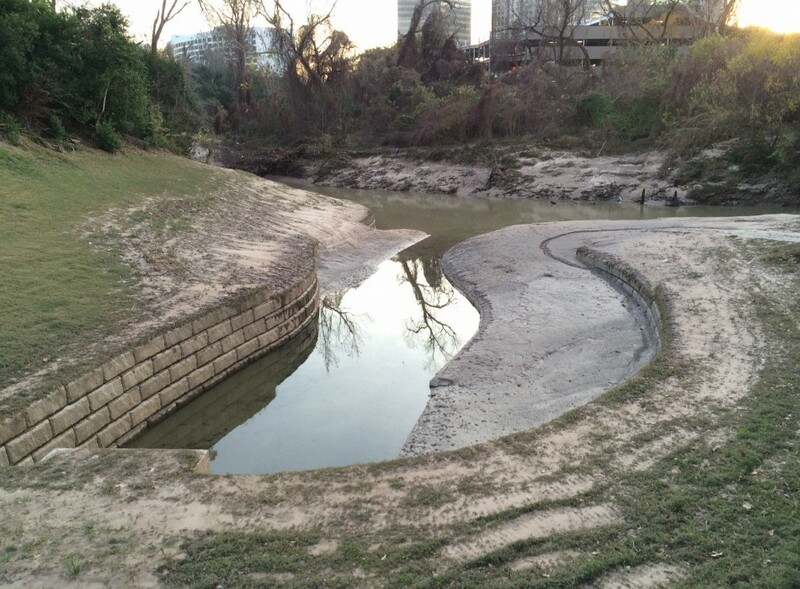 Completed no-longer-a-boat-launch drainage outfall cleared of mud on Nov. 1, 2014. Public access denied. 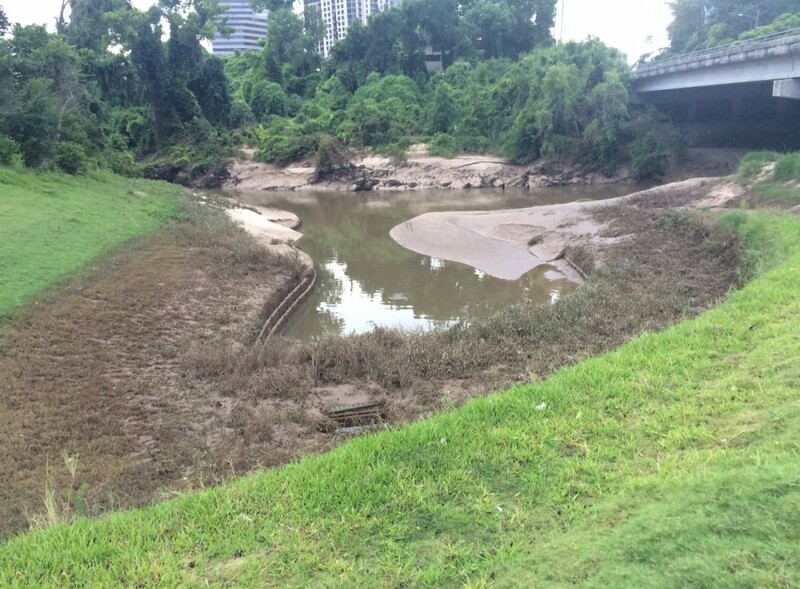 The drainage outfall but not a boat launch covered with mud in Memorial Park at Woodway. Photo by Bill Heins on February 16, 2015. 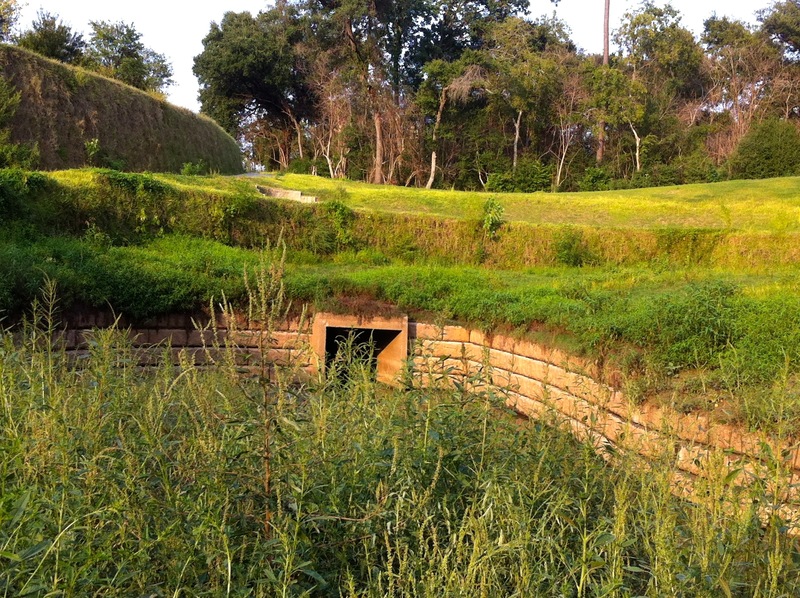 Memorial Park at Woodway drainage outfall seven weeks later on Aug. 5, 2015. Natural landscaping by Buffalo Bayou, Aug. 28, 2015. 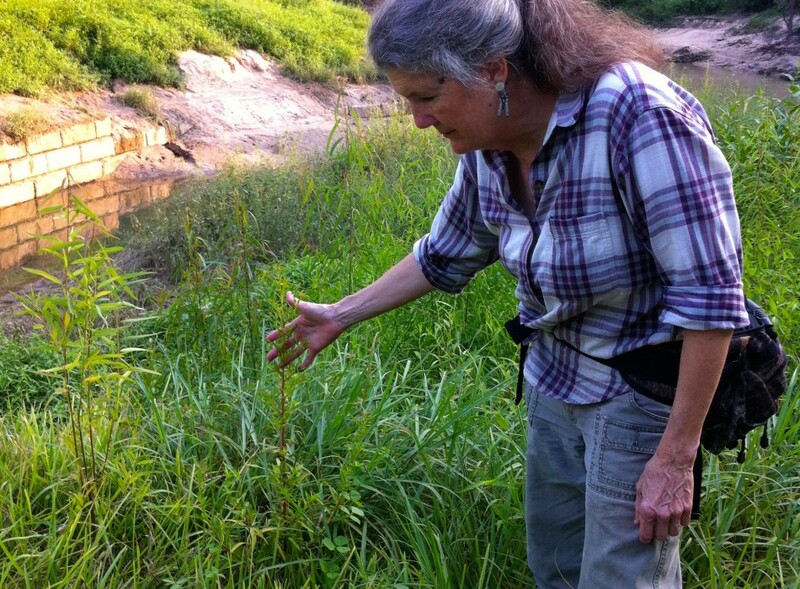 Native plant expert Katy Emde examining mostly native plant garden planted by Buffalo Bayou during the Memorial Day flood, Aug. 28, 2015. Public access still denied. Splendid description of natural processes that helps me understand how the bayou replants and revitalizes itself. Thank you, Susan, for continuing to point out the value that can come from allowing the bayou to replant itself. Too bad the contractors took the heavy -handed approach to designing the outfall.